Indian Mobile Handset maker LAVA Mobiles, has been awarded “Corporate Excellence Award” for being the fastest growing Telecommunication Company in India by Amity University. Amity “Corporate Excellence Awards” is the Asia’s largest three day international Business Summit and Research Conference where 13 most coveted Corporate are awarded the Excellence Awards. 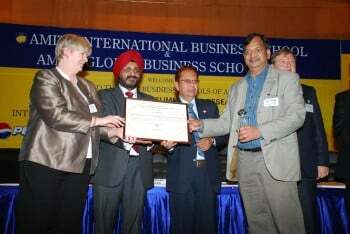 Speaking on the occasion Mr. S N Rai, LAVA International, said, we are thankful to Amity for giving us the honor. This award is the result of our commitment to come up with consumer insight driven innovation and adding value to consumer. The company has already expanded its operation in all the states of India. Today LAVA boasts of a network of 1,000 distributors and presence in 50,000 retail counters.